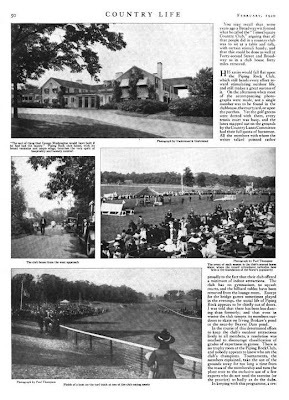 An article on the Piping Rock Club designed by Guy Lowell c. 1911 in Matinecock. Click HERE for more on the Piping Rock Club. Click HERE to see the club on google earth and HERE on bing. 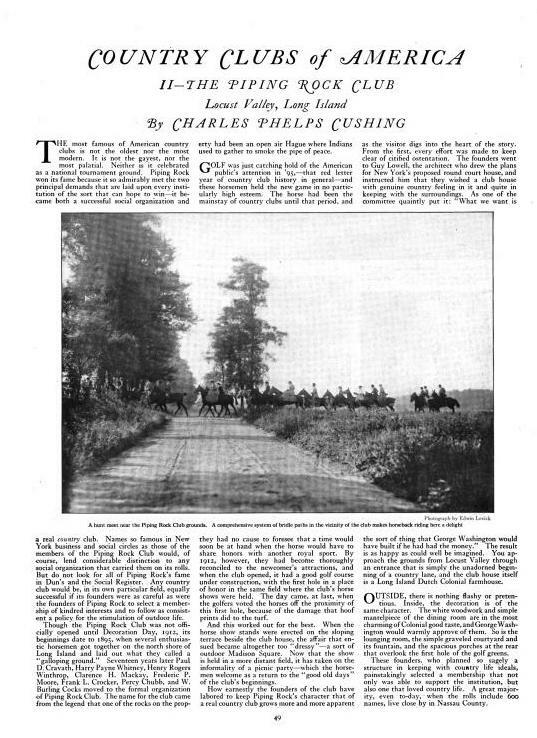 Article from Country Life, 1920. I'm certain there is more to know about this club. If you think one of us is going to spill the exact recipe for the Piping Rock southside, guess again. I'm still getting the lightbox when I click the pictures. The first one opens ok but the second comes up in the new format. ugh! Anon 11:37am -- I'm impressed you feel free to speak on behalf of the entire membership of the Piping Rock Country Club. But I want to point out I didn't say, "Spill the dirt!" or "What's your secret handshake?" What I said was: look at what's already in Wikipedia & contribute. For example: I was interested in the story about Cole Porter's accident there. I don't pretend to even guess or be worthy of knowing what the "exact recipe for the Piping Rock southside" is. I believe the southside was lemonade, mint and choise of vodka or rum or gin. I was a bartender at the Creek Club for a party. Also what is the average age now at the piping rock? Okay, now I’m embarrassed; I didn’t realize Anon 11:37am was making a joke about a drink … I thought he/she was being snotty about belonging to a prestigious club. Anon 11:37am you have my sincere apology. BTW, I would pick rum & want mine really cold. My grandmother worked at both the main and beach Piping Rock Clubs for many, many years, as well as at the Beaver Dam Winter Sports Club. I myself spent a summer working at Seawanaka C. Yacht Club watching closely, among other pecularities, how the southsides were assembled- I was sent out to pick the mint in fact. The "mix" is much more than lemonade - mostly pure lemon juice with a simple syrup and the mint steeped in it for days in gallon jugs. Mt. Gay Rum, vodka or gin - these folks drank them like lemonade, that's for sure! Some wanted a bit of triple sec added, but the purists did not. Additionally, torn fresh mint leaves were muddled and put on top - always in a tall (collins) glass. I think this was the basic recipe used at all of the north shore clubs. 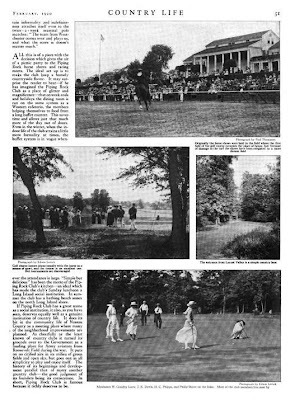 Surprisingly (or perhaps not to readers here) members of these clubs treated staff very well and my grandmother in particular knew the members and their kids quite well. It was a fascinating look at how the wealthy relaxed. Could anyone tell me what the fee is to join? I have a friend who is a member that asked if I would like an invitation. I was thinking of joining Muttontown CC, but heard that Piping Rock may be a better for young couples looking to meet people in the area. I heard they have a special program for young couples, and was curious what that was, and how much it cost.